US demand for wind turbine systems is forecast to reach $18.9 billion in 2018, a nearly nine-fold increase over severely depressed 2013 levels. The market for wind turbines tends to be highly volatile due to its reliance on government incentives. Feed-in tariff payments and various grants from the Department of Energy will drive gains going forward. 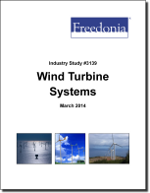 This study analyzes the $2.1 billion US wind turbine system industry. It presents historical demand data for 2003, 2008 and 2013, and forecasts for 2018 and 2023 by type (horizontal axis, vertical axis), component (e.g., nacelle, rotor system, towers), application (e.g., electric power generation by utilities, distributed electric power generation) and US region. The study also considers market environment factors, details industry structure, evaluates company market share and profiles 36 industry players, including General Electric, Vestas Wind Systems and Siemens.